Pinterest continues to be one of the fastest growing social networks and if your services or products are very visual it can be a great internet marketing tool. It is ever evolving and recently launched the support of animated gif pins, giving marketers another dimension to play with. Creating an animated pin is an easy process. Start by putting together a collection of photographs. make sure all the photos have the same dimensions. Upload the photos to http://gifmaker.me/ making sure the order you upload them matches the order you would like to see them. Adjust the canvas size to match your photos and set the animation speed at a level that suits the nature of the animation. Click CREATE and download your animated gif. Upload to Pinterest. The animated Gif will have a small button automatically added. This allows visitors to click and watch your animation. A good website is a “living” marketing tool that can evolve to accommodate different approaches to engage with it’s users. 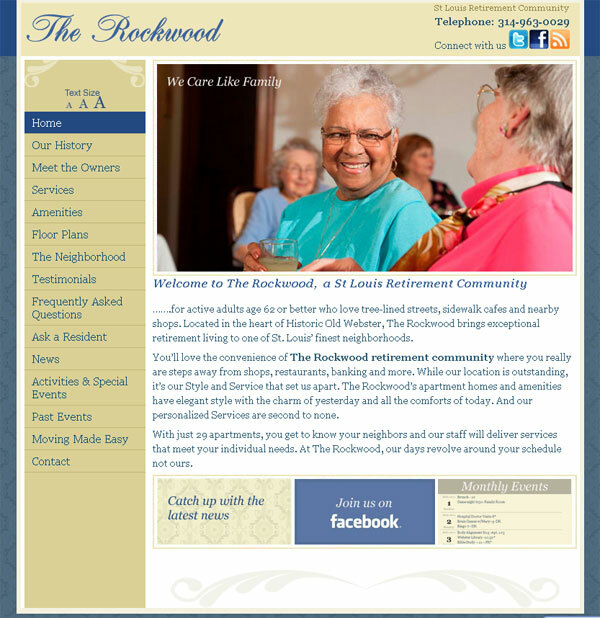 Our long standing client, The Rockwood, a St Louis retirement community, understands this and recently asked us to revisit their site and make suggestions on how it could be improved. The site has now been overhauled so it performs better in the search engines and offers interactions with it’s users through social networking sites Facebook and Twitter. We also built them a custom WordPress blog which was seamlessly integrated into the site. The New Year often give pause to thought on how you are conducting your business. Are you making the most of your opportunities, using your time efficiently, attracting the right sort of clients? It is a time for reviewing and updating and I have a number of things I will be updating over the next few weeks for my own business. On the agenda today was my email signature and as much of my business communication is done via email, it is an important little snippet at the bottom of every email I send. It essentially acts as an electronic business card. What are the elements of a good email signature? In my signature I also have my logo and also the word “Thanks” so I don’t have to type it out every time. The signature can also be edited on a per email basis, so if I need to have a more formal finish I can easily delete “Thanks” and replace with something more appropriate. The same goes for adding my surname. Setting up an email signature in Outlook is easy and there are great instruction on how to do so here. Here is a list of 7 things you, as a small business owner, can do TODAY, to increase the visibility of your web site. The better visibility, the better rankings in the search engines . End result more site visitors. Google’s blogger or WordPress.com are both good candidates for the novice blogger. They are easy to setup and require no technical knowledge . Ideally your blog should be integrated into your web site and given the same look/ feel for a seamless branded image (we can definitely help you with this). However having a standalone blog gives you a great platform to test the blogging waters and find your voice. Write regular blog posts relevant to your business expertise or product offering and make sure to create linksto your web site. Here are some articles on blogging which will help you get the most out of your blog. Is writing a blog worth the effort for a small business owner? Commenting on blog posts is a great way to increase the visibility of your site. A fitting comment and a relevant link to your site where applicable can lead to considerable traffic. Tread carefully though and do not spam. Twitter is a micro blogging tool, each Tweet, or post can have a maximum of 140 characters. Spend a little time setting up your profile which can include a picture, an all important link to your web site and a short bio. Next find some people to follow using the tools offered on the Twitter web site, then tweet away. The more you interact the more you will get of Twitter. Select a good name and populate the info section of the profile with your business information. You are now free to start sharing your thoughts, ideas, products, links, video and anything else you think is relevant to your business via the Facebook status window. You will need to build up your fan base so include a Facebook “like button” wherever you can e.g In your email signature, on your blog, on your web site. Yelp is a local directory allowing users to search for all sorts of services, everything from hair dressers to website designers. Once you are a member (free) you can post reviews on any listing. YouTube is the world’s 2nd most popular search engine ( Google is the 1st) so it stands to reason a presence there is worth the time and effort. Creating your free account is easy and uploading a video a breeze. If you have visually appealing images on your website particularly if they relate to your products or services e.g You are a landscaper and have a portfolio of completed landscape projects, Pinterest is a great place to share them. Pinterest is one of the newest and fastest growing social media platforms. It is a virtual pin board allowing you to organize and share all the fabulous images you find on the web. Boards and images can be shared and repined . Just added an Indigo image profile to Google+, Google’s social platform which rivals Facebook. Off to do a little research on how businesses can make the most this platform. In the mean time I’d love it if you’d come on over and join us. Undoubtedly you have these strange pixeled squares popping up all over the place. What are they and what can you do with them? 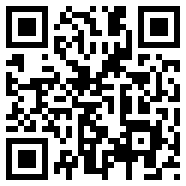 QR stands for Quick Response and they are read by a QR reader app you can easily download to your cell phone. The app decodes the graphic and reveals the information they contain. Creating a QR code couldn’t be simpler. There are a number on free online generation site such as Kaywa which allows you to generate a URL, text, phone number or sms QR code, or QRstuff which gives you more options on which information you would like to share. QRstuff also offers a subscription service which give you access to high resolution QR codes suitable for printing. Simple reason because they make life easier, no more pen and paper to jot down information. With a quick scan the information you want to convey is electronically stored. QR codes offer another avenue with which to engage with your customers. Does your web designer do this? Creating a great web site is only the start of an online presence for many business. Web Analytics – see how many hits your site is getting, where they are coming from, how long your visitors are staying etc. If not then you are using the wrong web design company. We take care of all the nuts and bolts to make your web presence work for you. 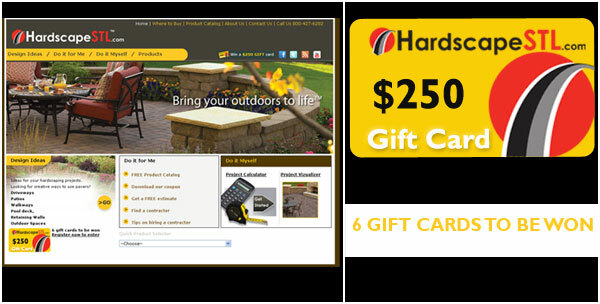 Yesterday I launched some updates for hardscapestl.com and they included a great spring contest where visitors can register to win a $250 gift card to spend on hardscape products. There are six up for grabs. New patio anyone? The internet has revolutionized the way we shop and for the savvy shopper there are coupons and opportunity for deals for just about anything. Adding a coupon or “opportunity to win” to a web site is marketing smart and combined with a social media push can drive considerable traffic to a site. After my last post Is your small business on board the social media wagon? I’d thought I’d share with you today some of my clients who are well on board the social media wagon. Here is a shout out to my clients embracing social media. Is your small business on board the social media wagon? The internet is ever evolving and as a web designer an important part of my job is to stay current with the tools and applications. One of the hottest trends over the last few years has been social media. It is a trend that is here to stay. Sharing: From a video on YouTube, a simple 140 character tweet or a submission to a news sharing site like Digg. Social media sites offer the ultimate platforms for freely sharing ideas, knowledge. Opportunity: Your clients and customers are using social media. Don’t miss out on the opportunity to converse with them on these platforms. Conversation: If I had to chose just one word to encapsulate social media it would be conversation. Those conversations can build trust, give higher visibility and ultimately generate sales. Interaction: Collaborate, combine and connect. Ask questions, offer solutions to questions posed by others. Join in discussions. Awareness: Use social media to build, maintain and create awareness of your brand. Listen: The art of a great conversation is to be able to listen. Marketing: Build a focused fan base through networking sites such as Facebook and LinkedIn. You have a ready made target audience for your marketing campaigns. Engage: Generate responses from your followers by including open ended questions, polls and offering information that will be truly useful to them. Dialogue: Social media is not a single voice. If you tweet join in conversations. If someone comments on a blog post post a comment back and generate a dialogue. Involve: Ask for feedback on products/ideas/services. Appropriate: Is Facebooking what you ate for lunch appropriate material for you social media profile. Do not dissolve your brand image with inappropriate information!